This post is an extension to Jacob Salema’s Guide that was picked up by Lifehacker. My main issue with his post is that he refers to the end result as a wireless router, which is not entirely accurate. This device is not meant to be internet-facing and is really more of a wireless/ethernet bridge with the configurations provided. My goal here was to extend what was provided in his initial post and make it suitable for placing a Raspberry Pi directly behind a cable modem and fully exposed to the internet. (Optional) USB Keyboard and HDMI Monitor to access the PI. All of these steps can be performed over SSH with a little creativity however. The Raspberry Pi’s performance is limited by the USB throughput of the WLAN adapter; which on the Raspberry Pi is a USB2.0 hub limited to a theoretical maximum of 480mbps, so you’ll never be able to pull gigabit ethernet here but this will get the job done for small sites. However if you have really crappy broadband like I do in this location the chokepoint will be the crappy broadband and not the Raspberry Pi. I repeated the same speedtest.net tests using a top-notch Lenovo X1 Gen3 laptop and got the exact same results so there is no lag using the raspberry pi here (for this crappy broadband connection). Since my broadband is so crappy here I’m using 802.11G wifi which won’t choke anything. Note: I probably wouldn’t trust this for anything over 10mbps. I think the Raspberry Pi 2 with 802.11n wifi could handle a standard 40mbps connection based on some of the numbers I’m seeing here. Perform these first before any of the other steps. Modify the interfaces file (/etc/network/interfaces) as shown below. Modify the DNSmasq configuration file to look exactly like what you see below. Feel free to modify your domain. Modify the configuration file for hostapd to have the following content. Notice we’re using the “hw_mode=g” option here this is because my limited internet connection couldn’t support max throughput of a wifi-N connection so there would be minimal benefit. If you’re interested in N and have a Raspberry Pi2 and a faster internet connection it may make sense to enable that in your scenario. Modify the defaults file for hostapd (/etc/default/hostapd) to have the same DAEMON_CONF line. The type of quotes used to surround the /etc/hostapd/hostapd.conf file are mission critical; if you use the wrong kind of quotes, hostapd will not start. You can debug the start of hostapd with the command “hostapd -d /etc/hostapd/hostapd.conf” which puts it into debugging mode. Reboot the Pi to apply the interfaces config, start the hostapd daemon, start dnsmasq daemon. After the reboot you should see your new wireless SSID being broadcast and you should be able to login to it too with your provided password. At this point we need to proceed with the IP tables configuration to setup routing and PAT (port address translation). Execute the following commands to enable NAT and routing for this particular session (we will make these settings persistent across reboots in steps 9 and 10). Routing allows the Pi to move (or “route”) packets between the two interfaces (Wlan0 and Eth0). 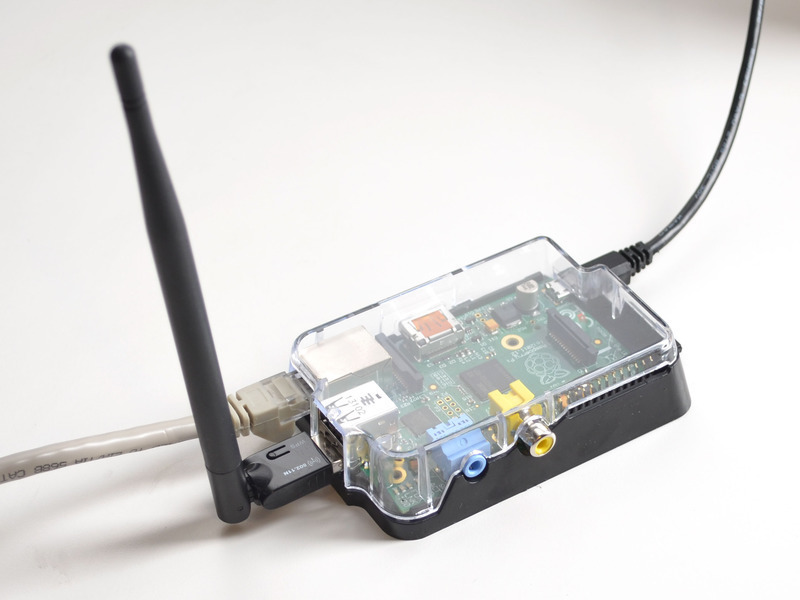 Making the Pi a Router allows packets which come in on the Wlan interfaces to be forwarded through the Pi and out the Eth0 port. IPtables is a program which interacts with the networking stack in the Linux kernel and tells the kernel how to handle incoming network traffic. There are all kinds of customizations that can be made to an internet facing router. What I show below are pretty basic and generally recognized as safe defaults. #log everything else that is about to get dropped. #drop everything else that has made it this far down and not matched. You can see the presently applied iptables rules using the “iptables-save” command with sudo. Once you’ve setup the rules you’d like, and you’ve tested that they behave as expected, proceed to step 8 to save the IP tables rules. During the installation of the iptables-persistent program it will ask you if you want to save the presently applied rules, select YES. Once the rules are saved, they can be edited at the /etc/iptables/rules.v4 (for normal IPv4 traffic). If you’re testing your iptables changes by applying the rules directly using the iptables syntax in step 7 then as you make changes, they can be made persistent by writing the output of the “iptables-save” command directly to the rules.v4 file like so. The following change allows the Raspi Router to move packets from one interface (wlan0) to another (eth0) by making the device a router. Looks good tho. A good next step might be integrating either the Pi-Hole or Adafruit’s (out of date) Adblocking access point via Pi. That’s what happens when you read the posts of a professional network engineer 🙂 Ethernet is measured in pieces haha.
. Not sure why you have the ‘driver=rtl871xdrv’ in the hostapd.conf. That doesn’t correspond to your wlan0.
. The ‘sudo iptables -A POSTROUTING -o eth0 -j MASQUERADE’ fails with a ‘iptables: No chain/target/match by that name’ error.
. You didn’t specify how to ‘apply [iptables] default config with the following commands’, so I just copy/pasted them into the console, then run ‘sudo iptables-save’ afterward. I assume this is correct. I’m presently stuck on the POSTROUTING error. I’ve re-checked all my entries for typos, but unfortunately don’t yet know enough of the linux environment to extricate myself from what seems to be a simple error. Please advise, if you would. Thanks in advance. I should state I’m running Jessie on a RPi2, which I’ve just started exploring. All packages have been updated/upgraded via apt-get. Hoang — That was my mistake I missed the table specification with the call to enable the NAT/PAT configuration. The command should read “sudo iptables -t nat -A POSTROUTING -o eth0 -j MASQUERADE” I will correct this in the post. Also you did applied the default config correctly, just copy-paste. I’ll make a note of that too. Thanks for the comments! That rtl818x likely means “put your actual last digit where the x is” as a shortcut to avoid listng a half dozen lins different by one digit. Put in rtl8187 and see what happens. Also your example didn’t have drv on the end, so maybe you ought not add it..
Use “sudo hostapd -d /etc/hostapd/hostapd.conf” to better debug hostapd startup failures. I’ll assume that it’s a driver issue as you suggest. What is the exact model of WIFI dongle you have? Could you attach the output from sudo lsmod and sudo lsusb and sudo lshw. Great article and I’m probably going to give it a try as well for boat usage; I only will be mounting the PI in the top of mast and add a 2nd WIFI local adapter like the little edimax on the 2nd USB port for outdoor boat usage as I my boat is from steel and I put the LAN cable down the mast for inside usage through another router. My issue is only that you sometimes need to logon to a website to just hit accept to get WIFI access. Would that still be possible? Thnx for the great write-up! I see no reason why that wouldn’t work. Any wireless users just masquerade as the raspberry pi so the wireless traffic looks like it is coming from a single device. First of all, great article! That was actually the one that made it work for me and I tested a bunch of them. to the very end of the file /etc/network/interfaces and now it works. Don't know if anyone else had this problem, but that worked for me.